Hands-on literacy, math and science components are woven into our daily curriculum and provide ongoing challenges and skill development. We believe that children need opportunities to express their thinking and feelings in many ways and allow them to do so through the use of various media such as painting, sculpture, shadow play, collage and music. The curriculum is enriched by experiences with specialist teachers who work with the classroom teachers to integrate Spanish, art, music, and physical education throughout the day. 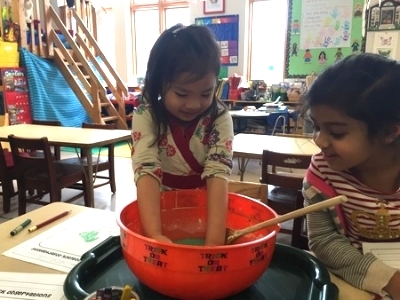 With a focus on curriculum integration and collaboration, specialist teachers regularly offer their expertise in the early childhood program. Contact our admissions office today. Our Edison, NJ location in Middlesex County is easily accessible from the nearby areas of Cranford, Summit, Scotch Plains, Millburn Townships, Somerset, Fanwood, Green Brook, Warren and Westfield and more.